Download Catalog #67 PDF: Click to download (requires Adobe Acrobat Reader). Printable in B&W or color! 1906 Parker 46 Taper-cap eyedropper-fill with heavy repousse “snail” pattern gold-filled cap and fluted pearl slab overlay barrel. At the turn of the last Century it was common practice for major pen manufacturers to adorn their pens with metal and pearl. 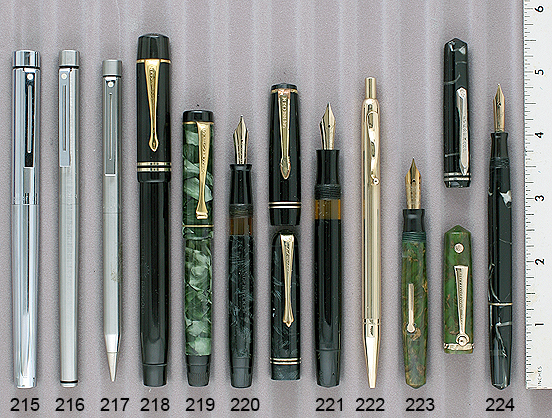 Most all pens were black hard rubber, and this was a wonderful way to add beauty, value and profit to their pens. 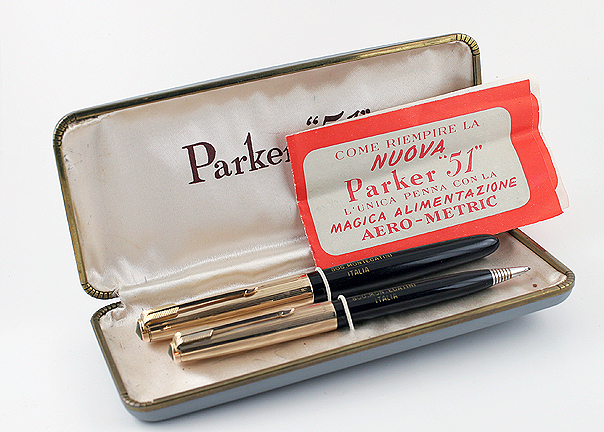 One of the most beautiful and sought after is the Parker 46. Most manufacturers covered only the barrel, leaving the taper cap unadorned because it was so hard to manufacture the cone shaped cap overlay. The 46 comes in various configurations, including alternating pearl and abalone, smooth slabs, fluted slabs and corrugated slabs. A wonderful and pristine pen which will make an outstanding addition to your collection! Parker #3 fine, extra-flexible nib. New-old-stock. Mint. 1935 Zerollo "Twopen" double nibbed Matchstick-filler in Red Marble. The cap top is unscrewed to access the stick used to fill the pen! GFT. These came in two sizes, this is the larger model. Sports two separate reservoirs, one for each of the fine nibs, to accommodate two different color inks. Turn the bottom knob to propel one nib, turn in the other direction to propel the other. Extremely rare! Both nibs are fine, flexible. New-old-stock. Absolutely mint in original Zerollo signed Art Deco box. You’ll never find one in better condition! Close-up of pen in box. 1934 Aurora Novum Oversize LF in Green Pearl with black veins. GFT. This is the model which has the filler lever on the very bottom of the pen. Medium, flexible nib. Near mint. 1900 Waterman 20 eyedropper-fill in smooth Black Hard Rubber. Nickel clip. Canadian manufacture. By far the largest pen manufactured by Waterman. Fine nib. A tad of imprint wear (fully readable), otherwise near mint. 1935 Montblanc 221(?) Push-knob-fill in Black & Pearl. GFT. Has “Meisterstuck” nib (fine, flexible). No model number on the blind cap and minor ambering, otherwise near mint. 1935 Montblanc 40 Masterpiece Push-knob filler in Coral Red (rare size and rare color!). GFT. Medium/fine nib. Cap imprint perfect, the barrel imprint with slight wear (fully readable), otherwise near mint+ with no signs of use. 1910 Parker 14 eyedropper-fill in Sterling Silver “Filigree” on BHR. The 14 (sterling silver) and the 16 (gold-filled) were Parkers best selling filigree pens, because of their perfect combination of beauty and balance. Later versions had screw caps and even clips. The slightest barrel ambering and a scratch to the hard rubber here and there (not to the overlay), otherwise near mint. Fine, flexible, italic nib. 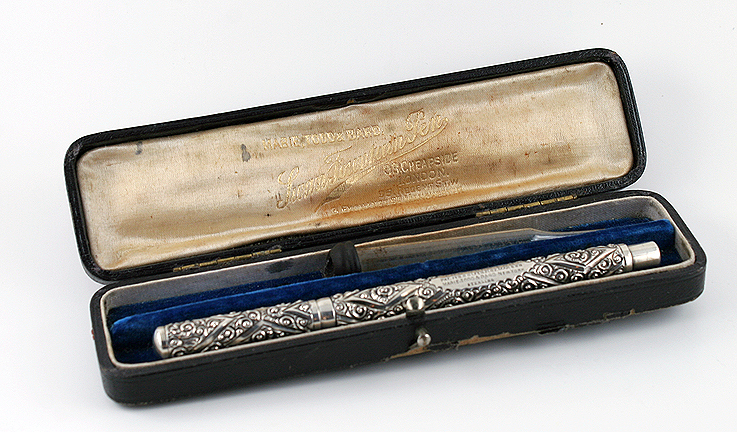 1918 Parker Duette “M-301 CM” BF Set in Sterling Silver Acid Etched “Floral & Vine” pattern. Strikingly beautiful, besides being very rare! “M” means metal; “301” means sterling silver; “CM” means clip. Medium nib. New-old-stock. Mint. 1918 Parker “Lucky Lock” twist-activated pencil for above set. This is Parker’s earliest design pencil where a “bayonet” mount with two pins is used to retain the cap. 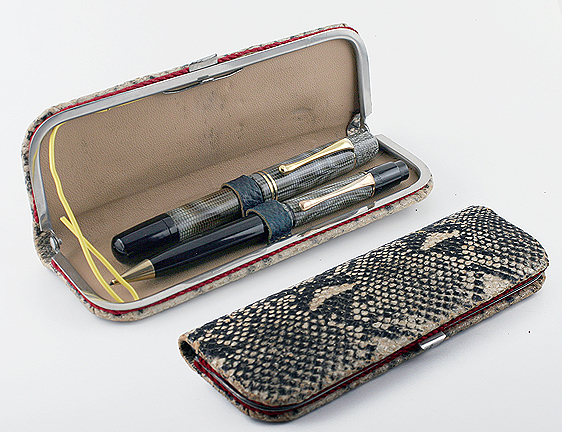 1916 Parker 70 Telescoping eyedropper-fill pen in gold-filled with “Alternating Pinstriped and plain panel” pattern. This fully marked Parker was most certainly made for Parker by the U.S. Fountain Pen Company which produced similar pens under their own brand. Minor scratches (noticeable with a loop) from being around for 100 years, otherwise near mint. No dents nor dings. Medium nib. 1905 Mabie Todd Swan Eyedropper-fill straight-holder in Sterling Silver Chased Repousse pattern. Quite exquisite! The gripping section is also silver covered. Broad nib, with early “over-feed.” New-old-stock. Mint in original silk and velvet lined signed box, with original eyedropper (most of the rubber bulb is missing). Close-up of pen in box. 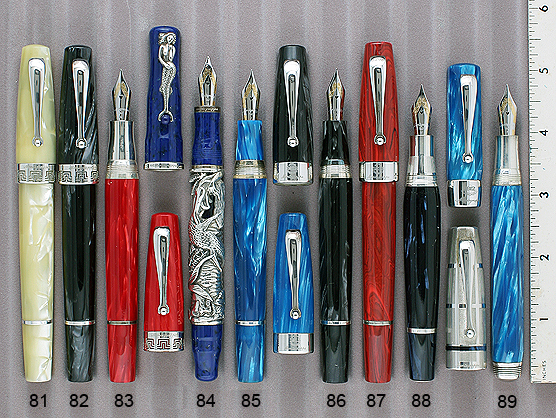 1930 Waterman Patrician LF in Turquoise (Blue & Bronze). GFT. One of the most beautiful of the patrician colors! Medium, flexible nib. Neat mint+. 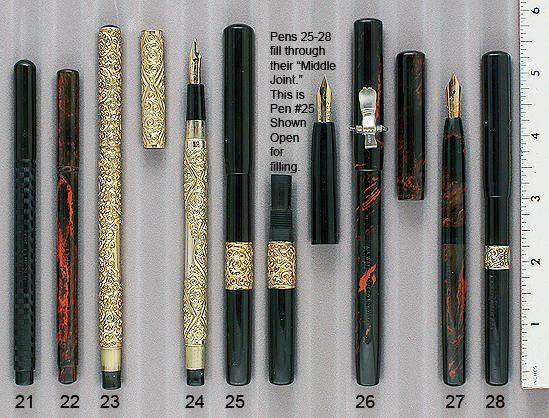 1930 Waterman Patrician LF in Onyx (Red Cream). GFT. Almost impossible to find in perfect color, such as this one. Absolutely no ambering or discoloration at all! Medium, flexible nib. New-old-stock. Mint. 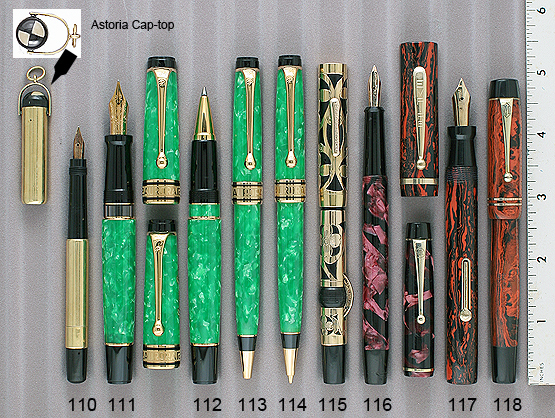 1929 Waterman Patrician LF in Moss Agate (Green & Bronze). GFT. Watermans first plastic pen, and what a pen it was! Fine, flexible, italic nib. New-old-stock. Mint. 1955 Montblanc 149 PIF in Black Celluloid (pre-precious resin). Early model 149 with the two outer cap bands in sterling silver. Short Visualated window. Medium, flexible nib. Wear to the vertical lines and dark at the very top of the window, otherwise near mint. 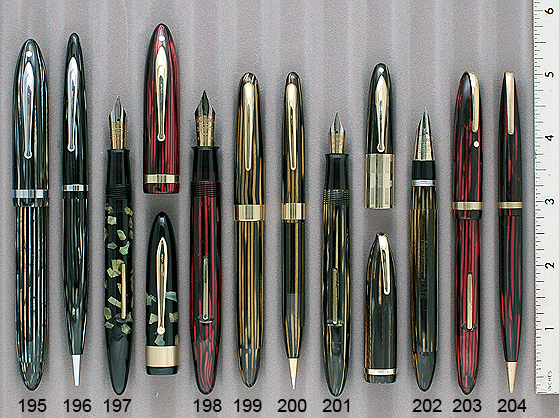 The A.A. Waterman Pen Company was founded about 1897 in New York City by Arthur A. Waterman who was no relation to L.E. Waterman. A.A. Waterman was known for their New Lincoln Pen (1904-1907) which was a regular eyedropper filler pen, their middle joint filler pen (1902-1907) and their Modern Automatic Self Filler, a twist filler (1902-1920). There are some exceptionally beautiful models made in gold filled metal and silver. Arthur A. Waterman was pushed out of his company in 1905 when Frazier & Geyer successfully sued him and took over the company. About 1912, L.E. Waterman also sued the A.A. Waterman Company and forced them to put a disclaimer stating, “Not connected with the L.E. Waterman Co.” on all their pens and advertising. The A.A. Waterman Pen Company began to fade away about 1916 and was just a memory by the 1920s. The company is believed to have been sold to the Chicago Safety Pen Company. Fountain Pens and Pencils The Golden Age of Fountain Pens, Fischler and Schneider, 1990, Page 249. 1900 Frazier & Co. #2 “Lincoln” Straight Holder eyedropper-fill in Black “Checkerboard” Chased Hard Rubber with correct smooth BHR cap. The “Lincoln” was made by Frazier & Geyer both before and after they formed their 1904 partnership with A.A. Waterman. This one likely made before, as it has a “Frazier & Co” nib. It was eventually renamed the “New Lincoln.” Medium, extra-flexible “Falcon” shaped nib (rare). 1900 Frazier & Co. #2 “The Lincoln” Straight Holder eyedropper-fill in Red Mottled Hard Rubber. See pen above for information about Frazier & Geyer. Medium, triple-flexible nib. Near mint. 1902 A.A. Waterman #2 Modern Twist-fill in Gold-filled “Chased Repousse Snail” pattern. Indicia engraved in script, “LBN.” Fine, triple-flexible nib. Near mint. 1902 A.A. Waterman #2 Modern Twist-fill in Gold-filled “Chased Repousse Diamonds & Snail” pattern. Fine, flexible nib. Near mint. 1903 A.A. Waterman #5 Middle-Joint Cone Cap eyedropper-fill in smooth BHR. Shown open and closed, so you can see the center joint. Wide gold-filled repousse cap band. Fine, flexible nib. Near mint. 1903 A.A. Waterman #5 Middle-Joint Cone Cap eyedropper-fill in Red Mottled Hard Rubber. NP accommodation clip. Fine, triple-flexible nib. Near mint. 1903 A.A. Waterman #4 Middle-Joint Cone Cap eyedropper-fill in Red Mottled Hard Rubber (very rare). Besides the regular barrel imprint is “The Modern Fountain Pen.” Fine, flexible nib. Some wear to the second line of the barrel imprint, otherwise near mint. 1903 A.A. Waterman #3 Middle-Joint Cone Cap eyedropper-fill in smooth BHR. Wide gold-filled repousse cap band. Fine, extra-flexible nib. Near mint. 1903 A.A. Waterman #2 Middle-Joint Cone Cap eyedropper-fill in smooth BHR. Wide gold-filled repousse band at the top of the cap. 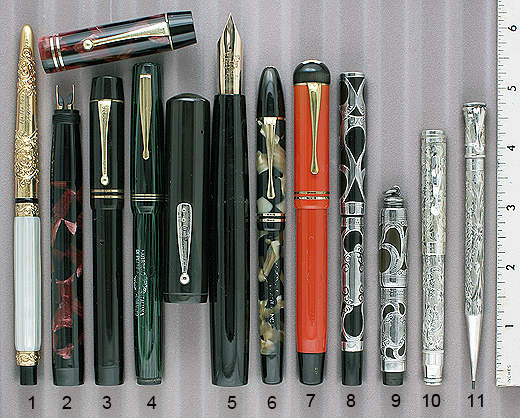 Besides the regular barrel imprint is “The Modern Fountain Pen.” Medium/broad, triple-flexible nib. Near mint. 1905 A.A. Waterman #3 Twist-fill Cone Cap in Gold-filled “Filigree” overlay on BHR. The filigree is reminiscent of the “Parker 16” and may also have been done by Heath of New York. Indicia engraved in script, “AW.” Fine, triple-flexible nib. A ding or two in the cap derby, otherwise near mint. 1912 A.A. Waterman #3 Twist-fill Cone Cap in smooth BHR. Wide GF band at the top of the cap. Fine, extra-flexible nib. New-old-stock. Mint. 1912 A.A. Waterman #3 Twist-fill in Gold-filled “Filigree” overlay on BHR. The filigree is reminiscent of the “Parker 16” and may also have been done by Heath of New York. Medium, flexible nib. New-old-stock. Mint. 1912 A.A. Waterman Model 70M/6 #7 Twist-fill Cone Cap in BCHR. NP Clip. The barrel has the “Not connected with the L.E. Waterman Co.” imprint. Fine, extra-flexible nib. 1913 A.A. Waterman #3 Twist-fill Cone Cap in BCHR. GF extra-wide repousse band at the top of the cap. The barrel has the “Not connected with the L.E. Waterman Co.” imprint. Fine, extra-flexible nib. New-old-stock. Mint. 1913 A.A. Waterman #2 Twist-fill Cone Cap in BCHR. NP clip. The barrel has the “Not connected with the L.E. Waterman Co.” imprint. Medium, triple-flexible nib. New-old-stock. Mint. 1913 A.A. Waterman #3 Twist-fill in BCHR. GF wide repousse band at the top of the cap. The barrel has the “Not connected with the L.E. Waterman Co.” imprint. Fine, extra-flexible nib. New-old-stock. Mint. 1913 A.A. Waterman #2 Twist-fill Cone Cap in BCHR. The barrel has the “Not connected with the L.E. Waterman Co.” imprint. Medium New-old-stock. Mint. 1913 A.A. Waterman #2 Twist-fill Cone Cap in BCHR. The barrel has the “Not connected with the L.E. Waterman Co.” imprint. Broad, flexible nib. New-old-stock. Mint. 1913 A.A. Waterman #3 Twist-fill in Gold-filled heavy repousse “Floral & Vine” pattern on BHR. Strikingly beautiful! Indicia engraved, “GMC.” The gripping section has the “Not connected with the L.E. Waterman Co.” imprint. Fine, triple-flexible nib. Near mint +. Could be new-old-stock. 1913 A.A. Waterman #5 Twist-fill Cone Cap in Sterling Silver “Filigree” on BHR. The filigree is reminiscent of the “Parker 16” and may also have been done by Heath of New York. The barrel has the “Not connected with the L.E. Waterman Co.” imprint. Fine, flexible nib. 1915 A.A. Waterman Model 68F/5 #5 Twist-fill in smooth BHR. NP clip. Medium/fine, extra-flexible nib. Both the nib and barrel have the “Not connected with the L.E. Waterman Co.” imprint. Just a tinge of wear to the barrel imprint, otherwise new-old-stock. Mint. 1915 A.A. Waterman Model 49M/34 #2 Twist-fill in BCHR. Medium, extra-flexible nib. The barrel has the “Not connected with the L.E. Waterman Co.” imprint. New-old-stock. Mint. 1915 A.A. Waterman #2 LEVER-FILL ring-top in Gold-filled “Filigree” Pattern on BHR. Lever-fill A.A.’s are quite rare! The barrel overlay has the “Not connected with the L.E. Waterman Co.” imprint. Broad, flexible nib. A little wear at the very bottom of the barrel, otherwise near mint. 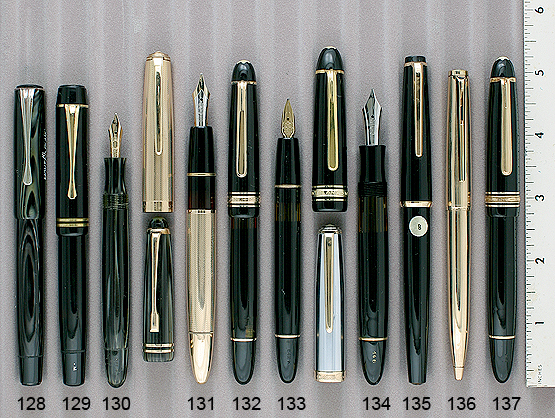 1944 Parker Aerometric-fill in Black. UK manufacture. 1/10 12K rolled-gold caps (the European term for gold-filled). Cap pattern is 5-converging pinstripes. Barrrels engraved “Soc. Montecatini Italia.” Montecatini is a villa location in Tuscany, Italy. The set was a prize awarded by the Italian Soccer League to the Montecatini team. Medium nib. The pen has been filled and the pencil eraser slightly used. One small ding in pen cap. In original box (a bit shopworn). Close-up of set in box. 1944 Parker Repeater pencil for above set. 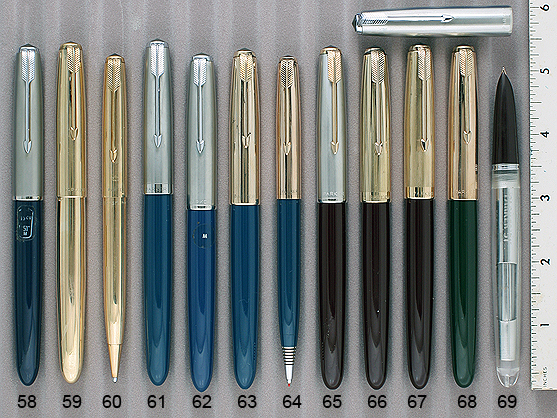 1949 Parker 51 Aerometric-fill in Buckskin with Lustraloy (brushed stainless steel) cap. Sports a custom made BBBB nib (it writes about 1/16″ wide)! Great for short notes, labels, and for the boldest signature in town! Has been filled, otherwise near mint. 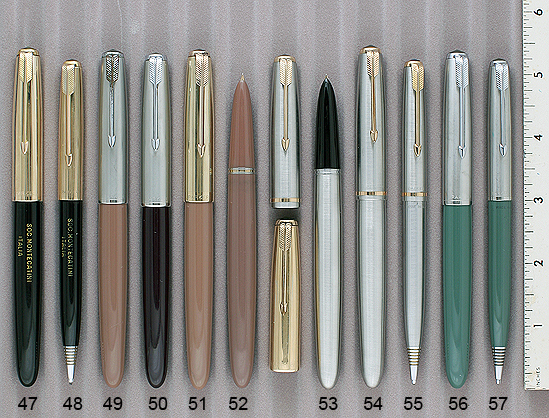 1949 Parker 51 Aerometric-fill in Plum (rare color) with brushed Lustraloy (stainless steel) cap. Fine nib. While the plyglass is still translucent, the pen has been filled at one time because the plyglass is not totally clear, otherwise near mint. 1951 Parker 51 Aerometric-fill in Buckskin with 1/10 12K GF cap in “5 Converging Line” pattern. Fine nib. One pinpoint ding in the cap, otherwise new-old-stock with a perfectly clear plyglass bladder. 1950 Parker 51 Flighter Aerometric-fill in Brushed Stainless Steel. GFT. Medium nib. No signs of any use, but the plyglass bladder has yellowed a bit from age. Mint. 1950 Parker 51 Flighter Aerometric-fill set in Brushed Stainless Steel. GFT. Medium/fine nib. New-old-stock with a perfectly clear plyglass bladder. Mint. 1951 Parker 51 Aerometric-fill in Navy Grey. Brushed Lustraloy (stainless-steel) cap. New-old-stock. Mint with clear plyglass bladder. [Four available: (2) extra-smooth, extra-broad nib; (2) fine nib]. See matching pencil below. 1951 Parker 51 cap-activated repeater pencil in Navy Grey with Brushed Lustraloy (stainless-steel) cap. Matches the pens above. New-old-stock. Mint. Buy with a pen above at $35. 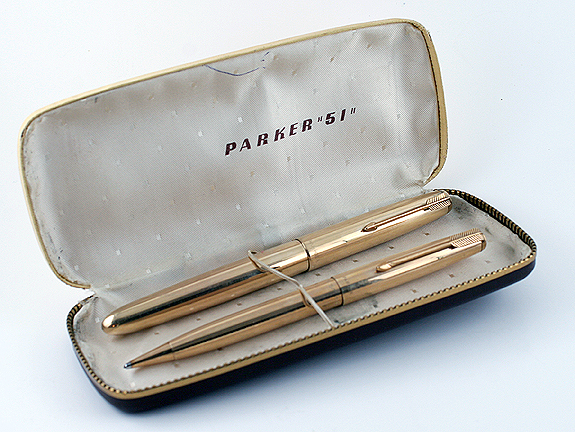 1953 Parker 51 Signet Set in Gold-filled. Alternating pinstripes and plain panels. Pen is user grade. Fine nib. No dents or dings, but surface scratches on the cap and barrel from being around and used. The pencil is far closer to mint. In original box (a bit shopworn). Excellent. Close-up of set in box. 1953 Parker Repeater pencil for above set. 1953 Parker 51 Aerometric-fill in Teal Blue. Brushed Lustraloy (stainless-steel) cap. Extra-fine/fine nib. No signs of ink, but has been filled (the plyglass has a green tint), otherwise near mint+. 1951 Parker 51 Aerometric-fill in Teal Blue. Brushed Lustraloy (stainless-steel) cap. Medium nib. New-old-stock. A few minor scuffs on the cap (visible with a loop) of the pen being around for 60 years, otherwise mint with original barrel label. ’51-’53 Parker 51 Aerometric-fill in Teal Blue. 1/10 12K Gold-filled cap in the “5-converging Line” pattern. New-old-stock. Mint. 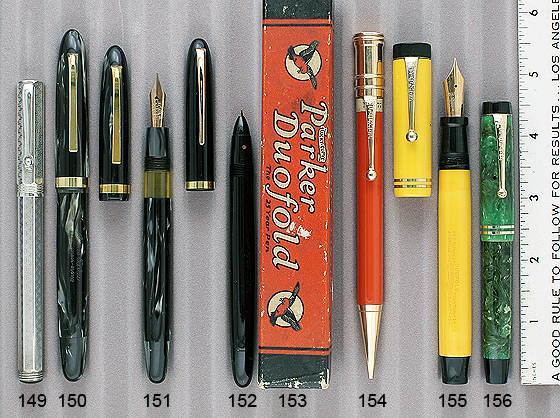 [Two available: 1951 – medium nib; 1953 – medium/fine nib]. See matching pencil below. 1954 Parker 51 cap-activated repeater pencil in Teal Blue with 1/10 12K Gold-filled cap in the “5-converging Line” pattern. Matches the pen above. New-old-stock. Mint. Buy with a pen above at $50. 1951 Parker 51 Aerometric-fill in Burgundy. Brushed Lustraloy (stainless-steel) cap and gold-filled clip. Fine nib. New-old-stock. Mint. 1948 Parker 51 Aerometric-fill in Burgundy. 1/10 12K Gold-filled cap in the “5-converging Line” pattern. Fine nib. A little wear to the barrel imprint (fully readable), otherwise mint. 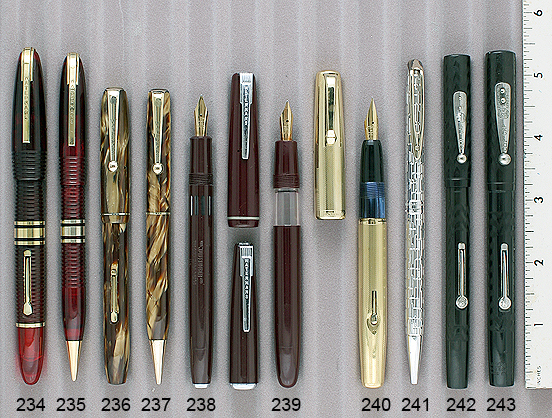 1948 Parker 51 Aerometric-fill in Burgundy with 1/8 14K Fully Pinstriped cap. Medium/fine nib. One pinpoint ding in cap, otherwise new-old-stock. Mint. 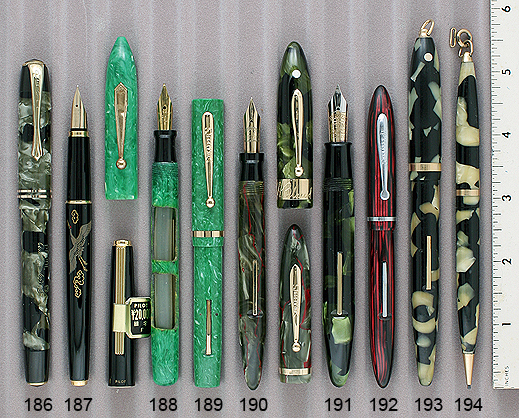 ’49-’53 Parker 51 Aerometric-fill in Forest Green. 1/10 12K Gold-filled cap in the “5-converging Line” pattern. Two available: (1) 1949 – medium/broad nib; (1) 1953 – medium/fine nib. 2005 Parker/ Kullock 51 Half-Demonstrator Aerometric-fill in Cordovan Brown with transparent barrel and brushed Lustraloy (stainless steel) cap. Pen near mint with clear plyglass. Broad nib. Barrel with normal tooling marks. 1951 Parker 51 Demi Aerometric-fill in Navy Grey. Brushed Lustraloy (stainless-steel) cap. Extra-smooth, medium nib. Near mint with clear plyglass bladder. ’48-’52 Parker 51 Demi Aerometric-fill in Black. 1/10 12K gold-filled cap in “5 converging pinstripes” pattern. Fine nib. Near mint with clear plyglass bladder. [Two available; (1) 1948 – fine nib; (1) 1952 – wet medium/broad]. 1949 Parker 51 Demi Aerometric-fill in Forest Green. 1/10 12K gold-filled cap in “5 converging pinstripes” pattern. Medium nib. Near mint with clear plyglass bladder. 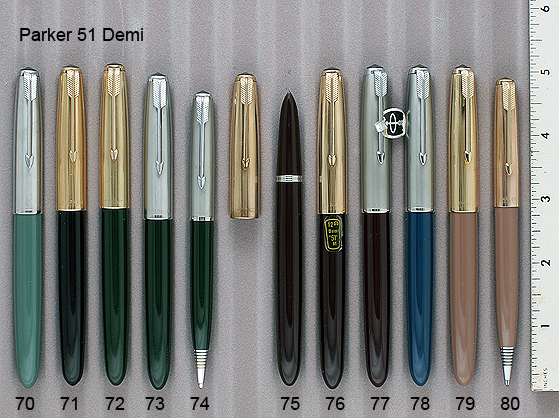 1953 Parker 51 Demi Aerometric-fill Set in Forest Green. Brushed Lustraloy (stainless-steel) cap. Medium/broad nib. No signs of use, but the plyglass has a slight tinge, otherwise mint. 1953 Parker Cap-activated repeater pencil for above set. 1953 Parker 51 Demi Aerometric-fill in Burgundy. 1/10 12K gold-filled cap in “5 converging pinstripes” pattern. Fine nib. New-old-stock. Mint. 1951 Parker 51 Demi Aerometric-fill in Burgundy. Brushed Lustraloy (stainless-steel) cap. Fine nib. New-old-stock. Mint with original clip label. 1953 Parker 51 Demi Aerometric-fill in Teal Blue. Brushed Lustraloy (stainless-steel) cap. Medium/fine nib. No signs of use, but it has been filled (some blue ink in plyglass), otherwise mint..
’48 -’53 Parker 51 Demi Aerometric-fill in Buckskin. 1/10 12K gold-filled cap in “5 converging pinstripes” pattern. Has been filled, otherwise near mint. Two available: (1) 1948 – medium nib; (1) 1953 – medium broad nib. See matching pencil below. 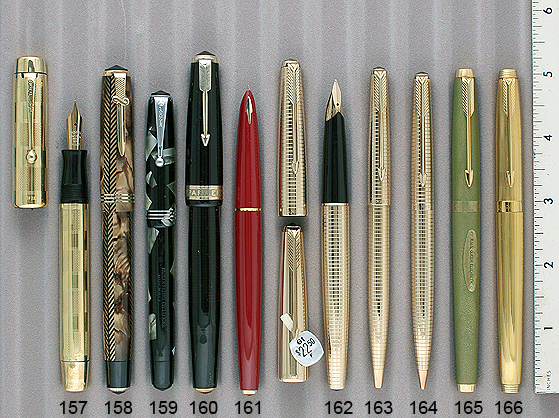 1950 Parker 51 cap-activated repeater pencil in Buckskin with 1/10 12K Gold-filled cap in the “5-converging Line” pattern. Near mint. Matches the pens above. New-old-stock. Mint. Buy with a pen above at $50. 2004 Montegrappa Miya cartridge/converter-fill in Parchment. Sterling Silver trim with “Greek Key” fretwork. Two-toned, 18K nib. New-old-stock. Mint. Remove the barrel to access cartridge, or remove blind cap to operate the converter. Converter included. Four available: (3) Medium; (1) Broad. 2004 Montegrappa Miya cartridge/converter-fill in Charcoal. Sterling Silver trim with “Greek Key” fretwork. Two-toned, 18K medium nib. New-old-stock. Mint. Remove the barrel to access cartridge, or remove blind cap to operate the converter. Converter included. 2004 Montegrappa Miya cartridge/converter-fill in Red. Sterling Silver trim with “Greek Key” fretwork. The gripping section and barrel threads are also sterling silver. Two-toned, 18K medium nib. New-old-stock. Mint. Remove the barrel to access cartridge, or remove blind cap to operate the converter. Converter included. 1998 Montegrappa La Sirene PIF LE #0514/2000 in Sea Blue with sculptured Sterling Silver clip and barrel overlay. Two-toned, 18K broad nib. New-old-stock. Mint. 2003 Montegrappa Classica Collection cartridge/converter-fill in Blue Pearl. Sterling Silver trim, including the barrel threads. Two-toned, 18K fine nib. New-old-stock. Mint. Remove the barrel to access cartridge, or remove blind cap to operate the converter. Converter included. 2003 Montegrappa Classica Collection cartridge/converter-fill in Charcoal Pearl. Sterling Silver trim, including the barrel threads. Two-toned, 18K nib. New-old-stock. Mint. Two available: (1) Fine; (1) Extra-fine. Remove the barrel to access cartridge, or remove blind cap to operate the converter. Converter included. 2003 Montegrappa Classica Collection cartridge/converter-fill in Red Ebonite. Sterling Silver trim, inlcuding the barrel threads. Two-toned, 18K fine nib. New-old-stock. Mint. Remove the barrel to access cartridge, or remove blind cap to operate the converter. Converter included. 2010 Montegrappa Miya Argento cartridge/converter-fill in Midnight Blue Pearl. Sterling Silver cap, gripping section and trim. Two-toned, 18K extra-fine nib. New-old-stock. Mint. Remove the barrel to access cartridge, or remove blind cap to operate the converter. Converter included. 2003 Montegrappa Symphony Collection Octagonal cartridge/converter-fill in Blue Pearl. Sterling Silver trim, gripping section and barrel threads. Two-toned, 18K fine nib. New-old-stock. Mint. Remove the barrel to access cartridge, or remove blind cap to operate the converter. Converter included. 2004 Waterman Charleston cartridge/converter-fill in Ivory. GPT. Barrel band set off nicely with two black bands. 18K, medium nib. New-old-stock. Mint. Converter included. 2005 Waterman Carene cartridge/converter-fill in Dark Green. GP fluted cap and GP slanted barrel bottom. 18K nib (fine) inlaid into contrasting black gripping section. New-old-stock. Mint. Converter included. 1996 Waterman LeMan 200 Rhapsody cartridge/converter-fill in Blue Marble. Two-toned, 18K, fine nib. New-old-stock. Mint. Converter included. 2005 Waterman Carene cartridge/converter-fill in Royal Blue. Matching cap with GP trim and GP slanted barrel bottom. 18K nib (fine) inlaid into contrasting black gripping section. New-old-stock. Mint. Converter included. 1990 Waterman Gentlemen cartridge/converter-fill in Hunter Green Lacque. GPT. 18K medium nib. New-old-stock. Mint. Converter included. 2000 Waterman Hemisphere cartridge/converter-fill Fountain Pen – Ball Pen set in Blue Lacque. GPT. Fine (alloy) nib. New-old-stock. Mint. Converter included. 2000 Waterman Hemisphere Capped Ball Pen for above set. 1984 Waterman LeMan 200 cartridge/converter-fill in Cordovan/Burgundy lacque (quite a rare color). Matching color gripping section. One of the only two solid colors Waterman used for this model pen (the other being black). GPT. 18K, medium nib. Converter included. New-old-stock. Mint. 1991 Visconti Ragtime I PIF in Silver Pearl with Black Veins. GFT. 18K, broad nib. New-old-stock. 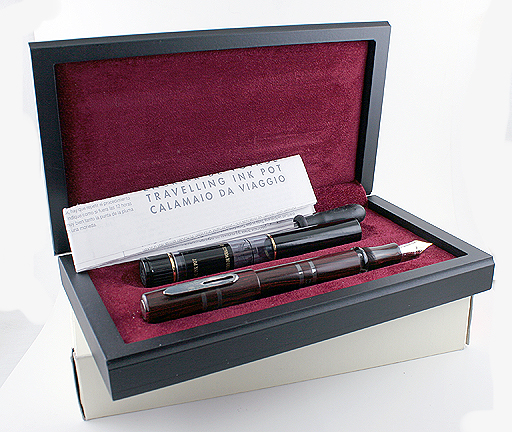 Mint in original Visconti Brown Leather snap-shut case with papers and outer box. Close-up of pen in box. 1991 Visconti Ragtime I PIF in Green Pearl with Black Veins. GFT. 18K, broad nib. New-old-stock. 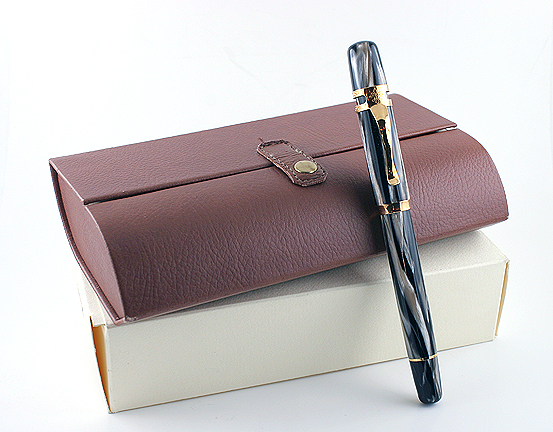 Mint in original Visconti Brown Leather snap-shut case with papers and outer box. Close-up of pen in box. 1991 Visconti Ragtime I PIF in Silver Pearl with Black Veins. GFT. 18K, medium nib. New-old-stock. 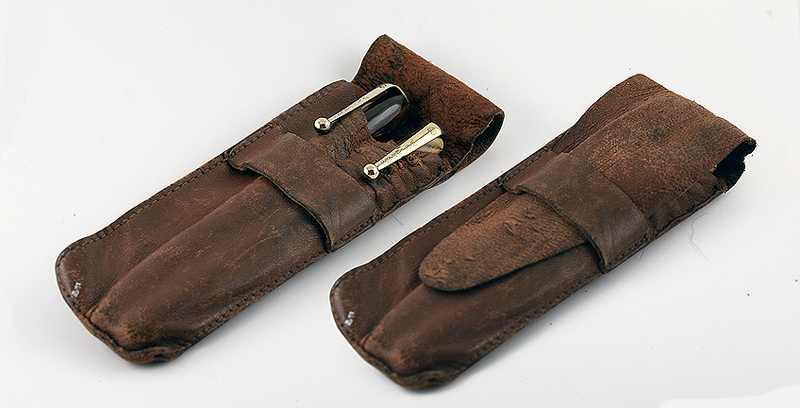 Mint in original Visconti Brown Leather snap-shut case, with papers and outer box. Close-up of pen in box. 1999 Visconti Ponte Vecchio cartridge/converter-fill in Blue and Bronze (beautiful!). GPT. 18K, broad nib. New-old-stock. 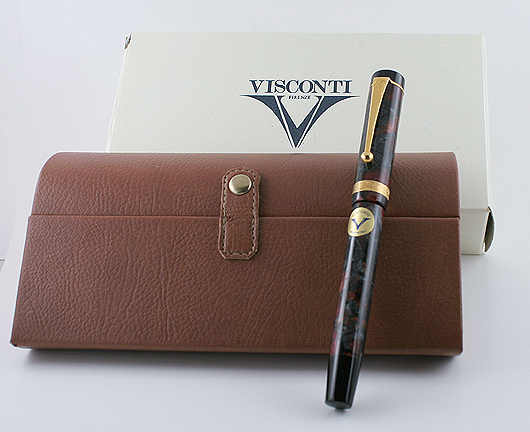 Mint in original Visconti Brown Leather snap-shut case with papers, barrel label and outer box. A very hard to find pen! Converter included. Close-up of pen in box. 2000 Visconti Voyager Rollerball in Lapis. GPT. Mint in original Visconti Brown Leather snap-shut case, papers and outer box. Close-up of pen in box. 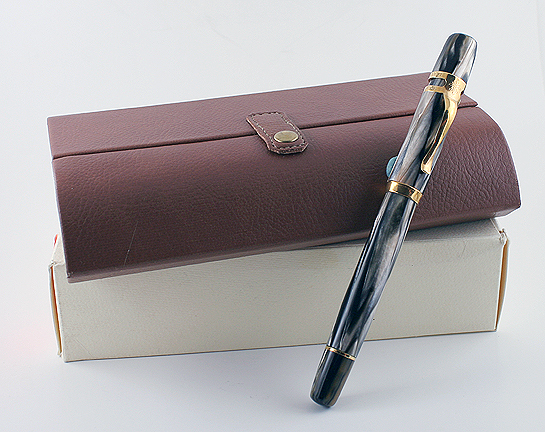 2000 Visconti 25th Anniversary of Joon Pen Shop LE 049/366 “Vacuum Power Filler” in Woodgrain Ebonite (hard rubber). Sterling silver trim (I’ll polish on request). 366 pens were made because 2000 was a leap year. 2-tone, 18K, medium nib. New-old-stock. 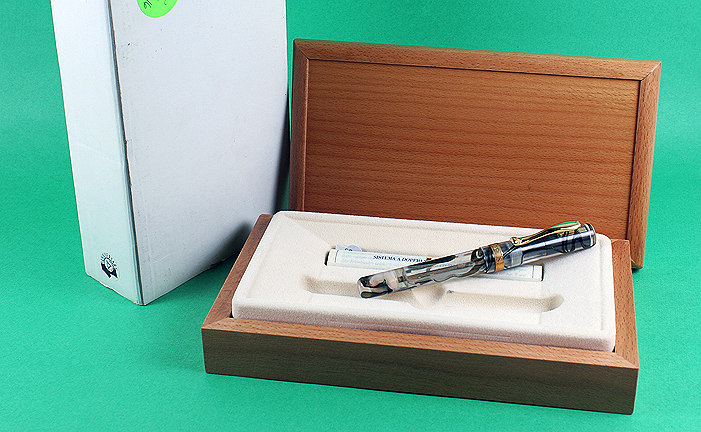 Mint in original box with eyedropper, inkpot, paperwork, and outer sleeve. List price $750. Close-up of pen in box. 2000 Visconti Voyager Demonstrator LE 074/288 “Vacuum Power Filler” in Transparent with Black veins. 18K solid gold trim!. 2-tone, 18K, medium nib. New-old-stock. Mint in original box with papers and outer sleeve. Close-up of pen in box. 2001 Visconti Portofino Faceted LE 104/150 cartridge/converter-fill in Ivory Pearl with Black & White Veins. Sterling silver trim. Two-toned, 18K, fine nib. New-old-stock. Mint. 2005 Visconti Inkpot traveling ink well in Chrome Plate with rectangle “windows” to view the amount of ink remaining. New-old-stock. Mint. 1933 Astoria 01 Short Safety ring-top in Smooth gold-filled. Black ends with bulbous derby with 4-quadrant black & white logo. Medium, extra-flexible nib. A few pinpoint dings on the upper part of the cap (noticeable with a loop), otherwise near mint. Will restore on request. 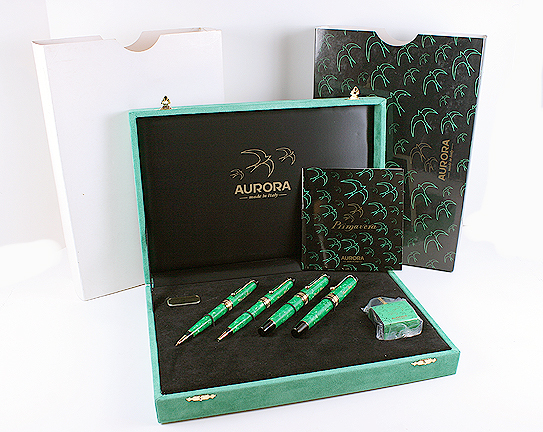 1998 Aurora Primavera “Matched Quartet” PIF Set LE #0452/1919 in Green Pearl. GPT, with “Greek Key” cap bands. 18K, broad, nib. Engraved “Steven Berg.” New-old-stock. Form fitted case also contains an Aurora ink bottle. Mint in original box with papers, outer box (one small corner tear) and outer sleeve. Close-up of set in box. 1998 Aurora Roller Ball for above set. 1998 Aurora Ball Pen for above set. 1998 Aurora Twist-activated Repeater Pencil for above set. 1918 Conklin #3 Crescent-fill in gold-filled “Four-Leaf Filigree” overlay in gold-filled. Extra-fine, flexible nib. New-old-stock. Mint. An exquisite pen! 1935 De La Rue & Co. 5601 #3 Plunger-fill in Red Pearl with Black veins. Set off nicely with black ends. GFT. Broad, flexible nib. New-old-stock. Mint. 1925 Empire #8 LF in Woodgrain Celluloid. A very beautiful and unusual celluloid. GFT. Medium/broad nib (even though it’s in a #8 size pen, the nib is really a #6 size). Near mint. 1925 Mabie Todd Swan 42 LF in Red Mottled Hard Rubber. GFT. The model number is imprinted on the bottom end of the barrel. Besides the normal vertical barrel imprint (a tad of wear), there is a horizontal imprint, “Posting,” which describes that the extra-fine, stiff nib was originally intended for bookkeeping. A tad of clip ball brassing. Excellent. 1928 Mabie Todd Swan 230B/61 LF in Red Mottled Hard Rubber. Very attractive model, with two G/F barrel bands and matching band at the top of the cap. Broad, flexible nib. New-old-stock. Mint. 1937 Mabie Todd L442E/52 4-size Swan “Leverless” twist-fill in Dark Blue Marble. GFT. Broad, italic nib. A tad of clip ball brassing, otherwise near mint. 1937 Mabie Todd L445/60 Swan “Leverless” twist-fill in Green Pearl. GFT. A tad of clip ball and cap band lower edge brassing, otherwise near mint. Broad, italic nib. Barrel imprint has been highlighted with gold. Near mint. 1929 Montblanc 25 PK Masterpiece in Coral Red. GFT. 18K “25” nib (fine). “Fluted” clip. Early version of the model, originally sold without a clip. Slight imprint wear, otherwise near mint. 1935 Montblanc 234 1/2L “Luxury” PIF in Black. GFT. 100 series style single raised cap band (rare) and “hourglass” clip. Visualated barrel. Cap engraved for the German industrial giant “Farbwerke Hoechst.” Stub, oblique nib. Minor brassing. No model number on blind cap. Tad of barrel lacquer wear. Excellent. 1935 Montblanc 4 BF in Platinum Striped. Produced in Italy for Montblanc. Very short black inner cap with no star (correct). NP “Fluted” clip. The fine, extra-flexible nib is signed “MONTBLANC 4 585” (“585” is in a diamond). Barrel imprinted: “Italol.” Near mint, and strikingly beautiful! 1936 Montblanc 234 ½ PIF in Black. GFT. Visualated barrel. Broad, italic nib, flexible nib. A little barrel lacquer wear, otherwise near mint+. 1950 Montblanc 744 PIF Meisterstuck in GF. Fully covered in vertical engine-turned fine wave chasing. Cap indicia engraved “NOWEA.” Nowea is a trade fair organization based in Dusseldorf (Nordwestdeutsche Ausstellungsgesellschaft mbH), and is now Messe Düsseldorf GmbH. In 1993 it hosted the Davis Cup Tennis finals. No dents or dings. Stub, oblique nib. A little brassing at the bottom of the turning knob, otherwise near mint. 1952 Montblanc 144 PIF Meisterstuck in Black Celluloid. GFT. Medium/broad, oblique nib. Long, visualated window. Near mint. 1952 Montblanc 642N PIF in Black with Silvexa cap (stainless steel). GFT. Wing nib. Visualated barrel with vertical lines in mint condition. Medium, flexible nib. A few minor surface scratches on the cap, otherwise near mint. 1952 Montblanc 146 PIF Meisterstuck in Black Celluloid. Rarer, early model, with flat feed a notch in the bottom of the inner cap to engage the raised bar on the clip. Long, visualated barrel window. GFT. Correct Alloy nib (broad, extra-flexible). Near mint. 1955 Montblanc 32 cartridge/converter-fill in Black. GFT. Broad nib. New-old-stock. Mint with original label. 1955 Montblanc Model 82 Ball Pen in G/F. Rare model! A lever in the clip activates the mechanism. Alternating pinstriped and plain panels. A handful of pin point dings on the cap (noticeable with a loop), otherwise near mint. 1955 Montblanc 144 PIF Meisterstuck in Black Celluloid. GFT. Broad, italic nib. Short, visualated window. Near mint. 1955 Montblanc 216 BF in Black. GFT. Medium/fine nib with a tad of flex. No imprints on turning knob, otherwise near mint. 1956 Montblanc 262 PIF in Black. GFT. Cap band with cut-out “V”s in a circle. Broad nib. Near mint. 1957 Montblanc O42 Monte Rosa PIF in Black. GPT. New-old-stock. Mint in original box with instructions and original label. Earlier Montblanc 14K “2” nib. 1959 Montblanc 32 Ball Pen in Black. GFT. Activator lever in clip. Near mint. 1971 Montblanc 181Ball Pen in Black. GFT. Activator lever in clip. Near mint. 1971 Montblanc Junior PIF in Black with Silvexa cap (stainless steel). Alloy, semi-hooded nib. Broad/double-broad, oblique nib. Minor surface scratches on cap, otherwise near mint. 1971 Montblanc 220 PIF in Black Matte. GPT. 14K semi-hooded nib (medium, with a tad of flex). Near mint. 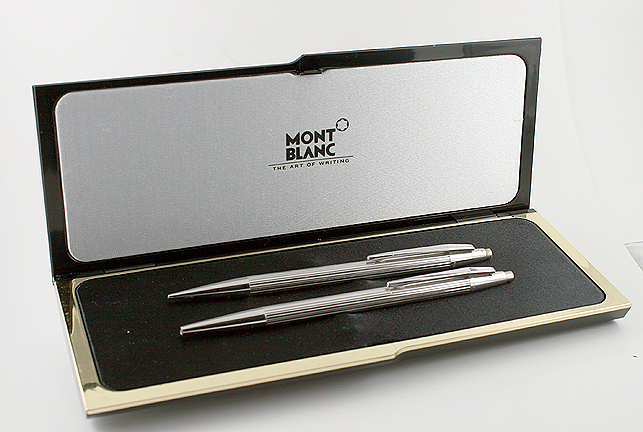 1973 Montblanc Noblesse Ball Pen – Pencil Set in Fluted Rhodium-plate. New-old-stock. Mint in original box. Close-up of set in box. 1973 Montblanc Repeater pencil for above set. 1980 Montblanc Classic cartridge/converter-fill in Burgundy. Visualated barrel. GPT. Medium nib. Near mint. 1994 Montegrappa Octagonal cartridge/converter-fill in Sterling Silver “Greek Key” pattern. Two-toned, 18K, fine nib. A minor surface scratch here and there, otherwise near mint+. No signs of use. Converter included. 1950 Omas Extra “Ogiva” 557/S PIF in Platinum Swirl. GFT. This is the rarest and largest size in which this model was manufactured. Only the 557 was called “Ogiva.” Visualated barrel. Extra-fine, triple flexible nib! New-old-stock. Mint. 1950 Omas Extra 556/S PIF in Platimun Swirl. GFT. Visualated barrel. Fine, extra-flexible nib. New-old-stock. Mint. 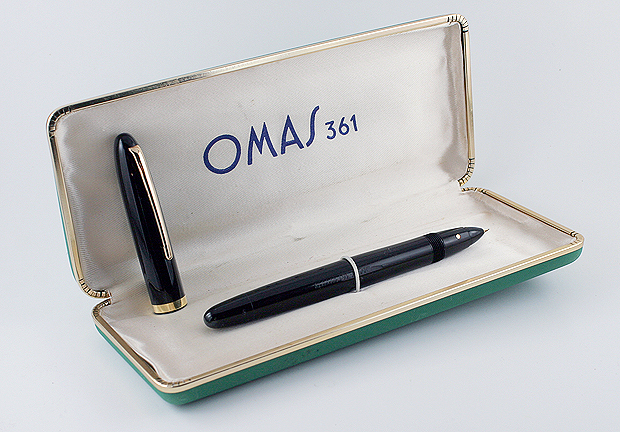 1951 Omas 361T (Round) PIF in Black, with unique two sided nib (fine on one side; turn it over for extra-fine on the other). GPT. New-old-stock. Mint in original box. Close-up of pen in box. 1924 Parker Duofold Sr. Box in Red with Black ends (designed to match the “Big Red”). Features the Scarlet Tanager, used in many of Parkers advertising and promotion activity, i.e., “The Duofold rivals the beauty of the Scarlet Tanager.” Filling instructions printed on the bottom of the box. No pieces missing, but is shopworn. Previous owner’s name hand written on the bottom of the box, “Arnold Johnson Essex Ia.” Arnold, and his wife Emma S., also signed the original instruction sheet which still remains with the box. In 1920 Essex Iowa, Shenandoah County, had a population of 767. This perhaps makes the box more interesting! Excellent. 1926 Parker Duofold Sr. Pencil in Red (Cardinal). GFT. Early plastic model, before Parker added the black bands at the top and bottom of the barrel. Comes with original eraser, plus a new one should you wish to use the pencil. New-old-stock. Mint with original label. 1927 Parker Duofold Sr. BF in Mandarin Yellow. GFT. Fine nib. Perfect imprint and cap. The barrel plastic has a very light red tinged color at both ends, otherwise near mint+. Would be $1400 without the red tinge. 1929 Parker Duofold Jr. In Jade. GFT. User grade; no wear or brassing, but there is ambering of both the cap and barrel (reflected in the price). Medium/fine nib. Otherwise near mint+. 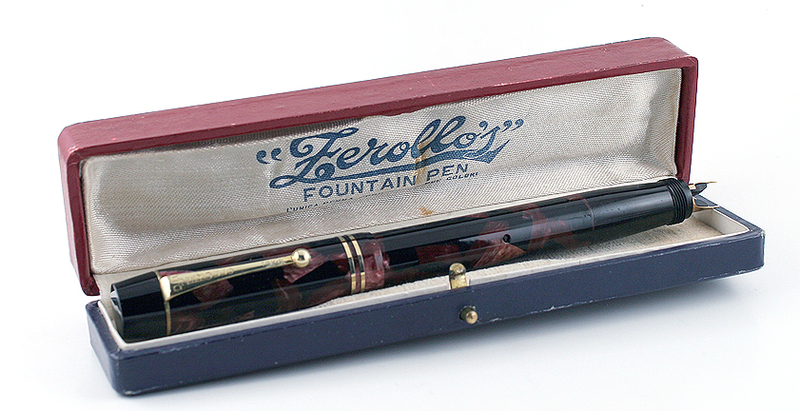 1929 Parker Duofold Special BF in Black with full 18K gold-filled overlay in Barley rectangles on smooth background. Full overlay Duofolds are very rare! The “Special” is a rare size in the Senior length and Junior girth. Underlying pen is Canadian manufacture. Fine nib. Overlay no doubt added in the UK. Near mint. 1937 Parker Deluxe Challenger Jr. BF in Silver Pearl Marble. NPT. Fine nib. New-old-stock. Mint. [Two available, the second from 1943 and with a medium/broad nib]. 1957 Parker 61 capillary-fill in Rage Red. 1/10 12K gold-filled cap in “alternating 5-pinstripes and plain panels” pattern. Fine nib. Has been filled, otherwise near mint+ with original label. 1967 Parker 65 Consort Insignia Cartridge/converter-fill 3-piece set in 1/5 12K Rolled-Gold (in the USA we call this Gold-Filled). Black gripping section. The Consort replaced the Rainbow Heirloom in Parker’s product line. It’s an attractive pinstriped grid design. Made in England. Unusual to find with metal (rather than plastic) barrels. Broad, italic nib. New-old-stock. Mint. Converter included. 1967 Parker Cap-activated ball pen for above set. 1967 Parker Twist-activated pencil for above set. 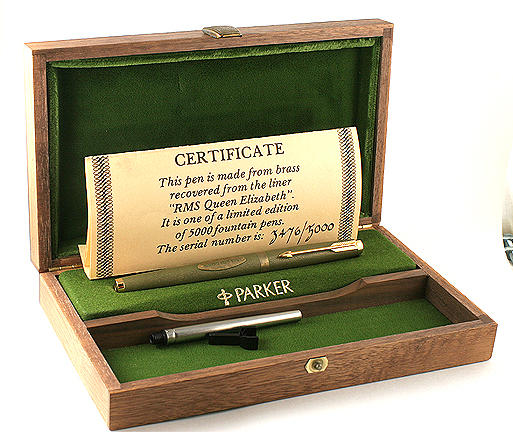 1972 Parker “Queen Elizabeth” Limited Edition 3476/5000 cartridge/converter-fill in brass which was recovered from the sunken liner, “RMS Queen Elizabeth.” Medium nib. Mint in wooden presentation box with brass plaque and original numbered certificate. Close-up of pen in box. 1984 Parker 75 “Millerais” cartridge/converter-fill in fully pinstriped gold-plate. Medium nib. Converter included. New-old-stock. Mint. 1989 Parker 75 “Cisele” cartridge/converter-fill in Sterling Silver crosshatch. Fine nib. Converter included. New-old-stock. Mint. 1990 Parker 75 Lacque cartridge/converter-fill in Thuya (Brown). GPT. 18K, medium nib. User grade, with a few pinpoint mars to the lacque, noticeable with a loop. Would otherwise be $150. 1993 Parker 75 Lacque cartridge/converter-fill in Thuya (Brown) Laque. GPT. 18K, medium nib. New-old-stock. Mint with original clip label. Converter included. 1933 Pelikan 100 PIF in Honey (extremely rare). GFT. Orange celluloid visualated window. Medium, oblique, triple-flexible nib. Near mint. 1933 Pelikan 100 PIF in Blue Pearl (very rare). Green celluloid visualated barrel. GFT. Fine, flexible nib. Near mint. 1937 Pelikan 101N PIF Set in Lizard. GFT. Broad, right-oblique nib, with just a touch of flex. Dark green celluloid visualated barrel. Near mint.+ in original snap-close Lizard carrying case. Close-up of set in box. 1950 Pelikan 400 PIF in Green Striped with Black Cap. GFT. Visualated barrel. Medium, right oblique nib (shaped like left foot). New-old-stock. Mint. 1950 Pelikan 400 PIF in Green Striped. GFT. Visualated barrel. Extra-smooth, medium, right-oblique nib (shaped like left foot). New-old-stock. Mint. 1953 Pelikan 100N PIF in Black. Green acrylic visualated window. GFT. Fine nib. New-old-stock. Mint. 1953 Pelikan	100N PIF in Green Pearl. Green acrylic visualated barrel. GFT. Medium/fine nib, with just a tad of flex. New-old-stock. Mint. Buy with matching pencil below at $425. 1937 Pelikan	Button-activated repeater Pencil in Green Pearl. GFT. New-old-stock. Mint. Buy with matching pen above at $425. 1955 Pelikan 520N PIF in Gold-filled. The “N” is the rarest of the series, having been manufactured for only one year. Fine nib. Near mint+. 1987 Pelikan M800 PIF in Blue Striped. GPT. “Old” style, with die-cut metal disc logo on the cap top and the gold plated disc at the bottom of the filler knob. 2-tone, 18C, medium nib. New-old-stock. Mint with original barrel and clip labels. 2008 Pelikan M800 PIF Demonstrator Special Edition in Transparent. 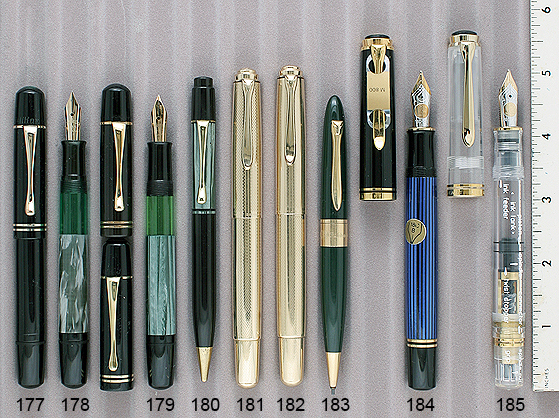 Made to commemorate Pelikan’s 175th Anniversary. GPT. Three-toned, broad, 18C nib. Parts of the pen are factory imprinted onto the pen barrel (this is the English version; there is a German version as well). A very hard to find pen! New-old-stock. Mint in original box with papers and outer box. Close-up of pen in box. 1946 Penol Ambassador #5 647 BF in Grey Pearl Marble. Smartly set off with black ends. GFT. 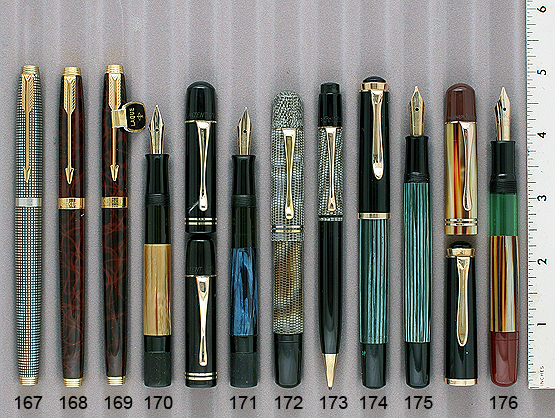 Made in Denmark by Chris Olson, who also manufactured Parker and Montblanc in the same factory. Fine nib. Near mint. 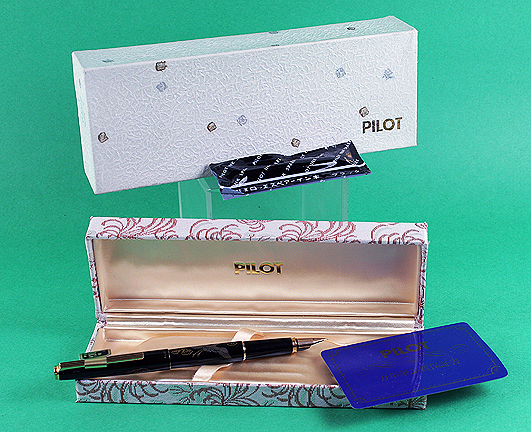 1986 Pilot “Tsuru” (Crane) Pilot Deluxe cartridge/converter-fill in Hiramakie over metal cap and barrel. 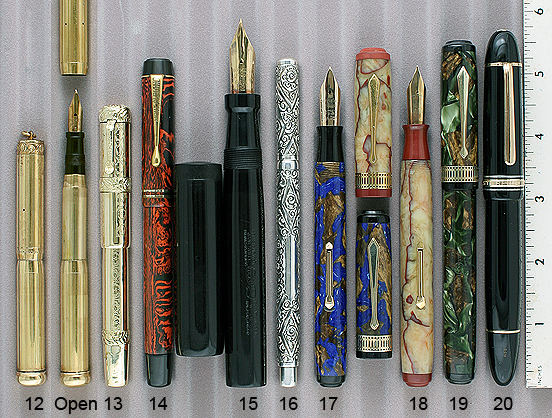 The “Deluxe” is a rarer, higher end, difficult to find series, with fluted clip.14K, broad nib. Artist signed. New-old-stock. 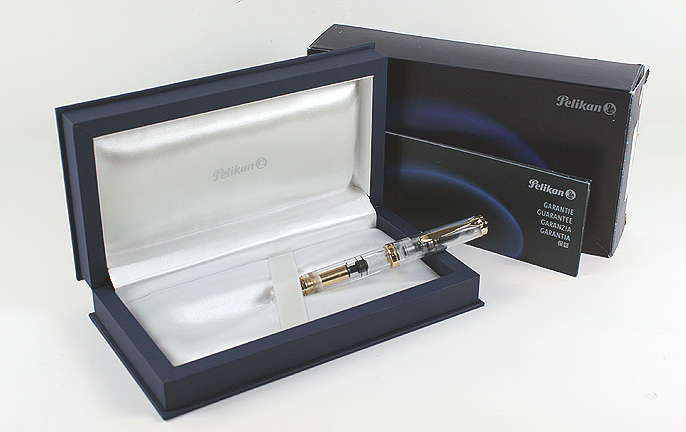 Mint in original hinged box with outer box, guarantee card, converter, cartridges, and price tag on pen clip. Pilot nibs are date coded – this one is 1/86. Close-up of pen in box. 1929 Renart #2 size LF Demonstrator in Jade. GPT. The barrel has two cut out “windows” to show how the lever and pressure bar operate. I fitted the pen with a silicon bladder so the ink supply can be seen as well. Gold-plate, broad, nib. No signs of use. 1925 Sheaffer Lifetime Flat Top LF in Deep Jade. GFT. Outstanding color! Fine nib. New-old-stock. Mint. 1937 Sheaffer Sr. Lifetime Balance 1000 Plunger-fill Set in Silver Striped. NPT. 2-toned extra-fine nib. Visualated barrel. Near mint. 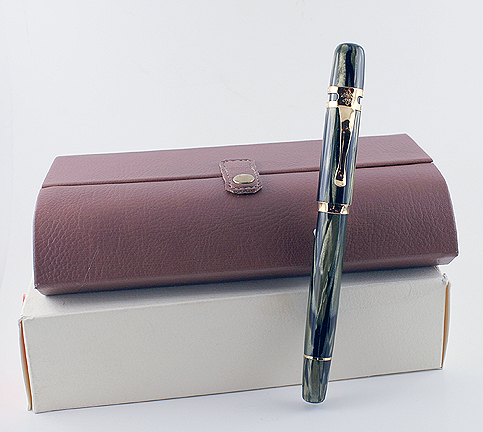 1937 Sheaffer Lifetime Balance LF in Ebonized Pearl. GFT. “Jeweler’s” model, with wide, fully pinstriped gold-filled band (indicia engraved “RT”). 2-toned extra-smooth, broad nib. Visualated section. 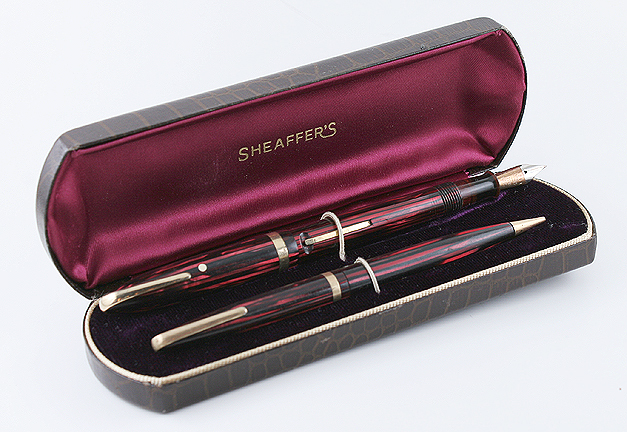 1937 Sheaffer Lifetime Balance Large 1000 LF in Carmine (Red Striped). GFT. Visualated section. Two-toned, fine nib. New-old-stock. Mint. 1945 Sheaffer #875 Balance plunger-fill Set in Golden Striped. GFT. Our plunger-fill pens are guaranteed for two years. Medium nib. New-old-stock. Mint in original leather, red velvet lined box. Close-up of set in box. 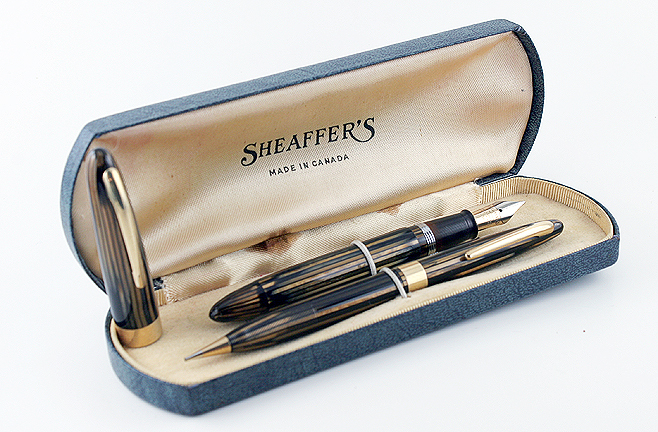 1941 Sheaffer Defender 500 Feather-Touch LF in Golden Striped. Made for use with military uniforms with its over-the-top “soldier clip,” designed so the pen doesn’t stick out over the shirt pocket. GFT. 2-toned nib. Visualated section. User grade; surface scratches, lever brassing and cap posting mark near the bottom of the barrel. Fine nib. Excellent. 1942 Sheaffer Triumph 1250 Plunger-fill in Golden Striped. The 1250 sports the 9/16″ long cap band. 2-toned, wraparound nib. Visualated barrel. Near mint. 1941 Sheaffer 875 Lifetime “Vigilant” Balance LF Set in Carmine (Red Striped). GFT. Over-the-top “Soldier” Clip, designed to be covered by the uniform’s pocket flap. Two-toned, medium nib. Visualated section. Near mint in original box. Close-up of set in box. 1941 Sheaffer Twist-activated pencil for above set. 1959 Sheaffer PFM I Snorkel Touchdown-fill in Burgundy. CPT. Palladium, medium/broad “Ball” nib (great for lefties as well as righties). New-old-stock. Mint with original chalk decal. 1959 Sheaffer PFM V Snorkel Touchdown-fill in Burgundy. GF cap and turning knob button. Medium/fine nib. Near mint. 1960 Sheaffer #5 Feather Touch Fineline LF “Service” pen in Green. CPT. This is the first Sheaffer Fineline “Service” pen I have seen in other then Fire Engine Red. Rare and unusual. 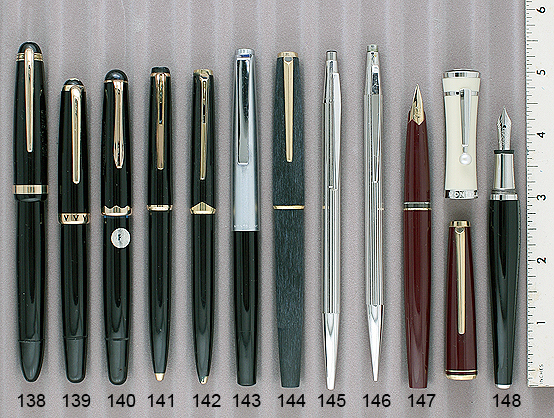 Loaners were pens from Sheaffer’s lower level lines which dealers loaned to customers when they took in their pen for repair. This one is imprinted “Rudolph’s Sheaffer Service Pen.” Medium nib. Near mint. 1976 Sheaffer Imperial Touchdown-fill Set in Sterling Silver Diamond pattern. GF clip. Fine nib. New-old-stock. Mint in original box with paperwork. Close-up of set in box. 1976 Sheaffer “Clip-activated” Ball Pen for above set. 1976 Sheaffer Targa 1000 cartridge/converter-fill in Pinstriped Polished Chrome. Inlaid palladium, fine nib. New-old-stock. Mint with cap label. Converter included. 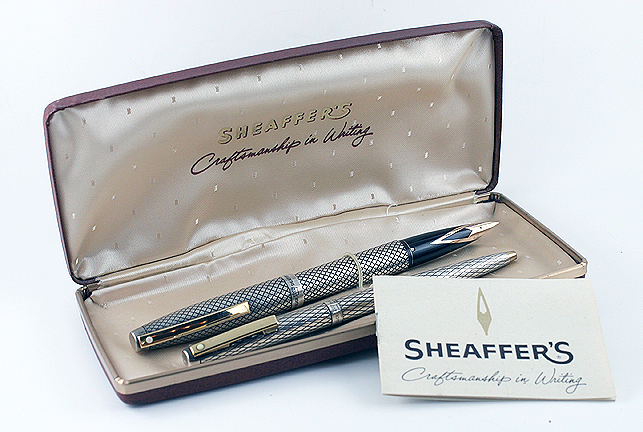 1989 Sheaffer Slim Targa 1001 cartridge/converter-fill Set in Brushed Stainless Steel. Fine nib. New-old-stock. Mint with original barrel label. Converter included. 1933 Soennecken Rheingold Express No. 915 BF in Black Hard Rubber. Has the white Casein “S” logo in the center of the inner cap, surrounded by the “starburst,” emulating the headlight of a locomotive. Does anyone know if this is why this model is called the Rheingold “Express?” GFT. Medium nib. Near mint. 1942 Soennecken 506 PIF in Green Pearl, set off nicely with black ends. GFT. Visualated barrel. Medium, flexible nib. Near mint. 1948 Soennecken 110 PIF in Dark Blue Pearl Web with Black turning knob. GFT. Made for the Swiss market. Broad, flexible nib. Visualated barrel. “Soldier” clip. New-old-stock. Mint. 1950 Soennecken 412 PIF in Black. GFT. Very early and rare version of the locking “click-fill” model. Visualated barrel. Broad, flexible nib. New-old-stock. Mint. 1930 Wahl Eversharp Equipoised Vest Pocket LF in Green & Bronze. GFT. Very rare pen, especially with the long roller-ball clip and “Rhomboid” cap band. Marketed for both the mans vest pocket and the side pouch in the ladies purse. Fine nib. Near mint. 1935 Wahl Eversharp Streamline Light Weight “Stenographer’s” bulb-fill in Smoke Grey (Silver Pearl on a Black background). Square pen with rounded corners! Medium/fine nib. New-old-stock. Mint. 1915 Waterman 0512 Eyedropper-fill in Gold-filled “Filigree” pattern on BHR. A very attractive and dainty pen, fitted with a wonderful fine, triple-flexible nib! New-old-stock. Mint. 1917 Waterman 42 “Continental Safety” eyedropper-fill in 18K gold-filled on BHR. Shown open, with nib extended. Alternating spiral panels of white and yellow filigree, separated by double rows of barley spiral. Two-color Continental Safeties are rare. Repousse rose on crown. Medium/broad nib. Near mint+. Restored. 1920 Waterman 442 ½ V Safety eyedropper-fill in sterling silver “Night & Day” pattern. USA made pen with overlay added and signed by Waterman France. Shown open, with nib extended. Fine nib. Just a tad of oxidation of the cap and barrel, and has been filled, otherwise near mint. Unrestored – will restore on request. 1927 Waterman 42 “Continental Safety” eyedropper-fill in 18K gold-filled. Alternating wide panels of flowers and vines formed within a barley background and “Gothic” (checkerboard) panels. The cap and barrel each with an inlaid wide enamel inlaid “three-leaf clover” band. Medium, flexible nib. Restored. Near mint. 1927 Waterman 42 “Continental Safety” eyedropper-fill in 18K gold-filled. Wonderful repousse design of interwoven diamonds formed within horizontal bands. Fine, extra-flexible nib. Near mint+. Unrestored – will restore on request. 1927 Waterman 42 “Continental Safety” eyedropper-fill in 18K gold-filled. Alternating wide panels, separated by rows of barley. Two panels of heavy repousse roses and vines, the other two panels are repousse vines and small flowers coming from a “horn of plenty.” Strikingly beautiful! Fine, flexible nib. Near mint. Unrestored – will restore on request. 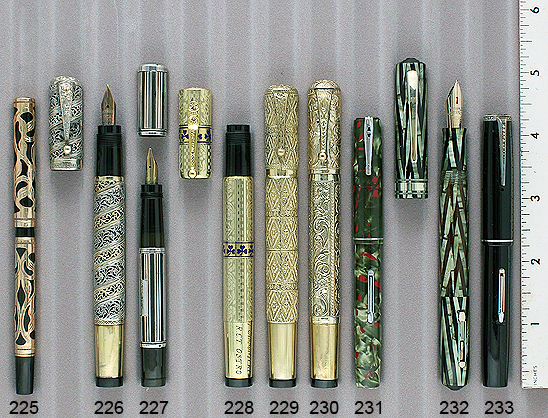 1930 Waterman 32V LF in Green Pearl with Red Specks. NPT. Extra fine/fine nib. New-old-stock. Mint with original label on the bottom of the barrel (a bit difficult to read). 1930 Waterman Ink-View Deluxe Vacuum-fill in Emerald Ray. The hinged lever is “pumped” to repeatedly depress the diaphragm and pump ink into the pen. GFT. Color-coded “Purple” keyhole nib (fine, stiff). New-old-stock. Mint. 1935 Waterman 32 LF in Black with Marcasite lined clip and derby (rare & beautiful). Marcasite jewelry has been around for centuries, with early examples discovered in Incan ruins and Egyptian tombs. Marcasite was thought to have therapeutic properties and was often used as a healing stone. Many cultures also believed marcasite would attract wealth and inspire creativity. It was during Queen Victoria’s reign that marcasite jewelry gained great popularity. NPT. Medium/fine nib. New-old-stock, with original label on the bottom of the pen (unreadable). Mint. 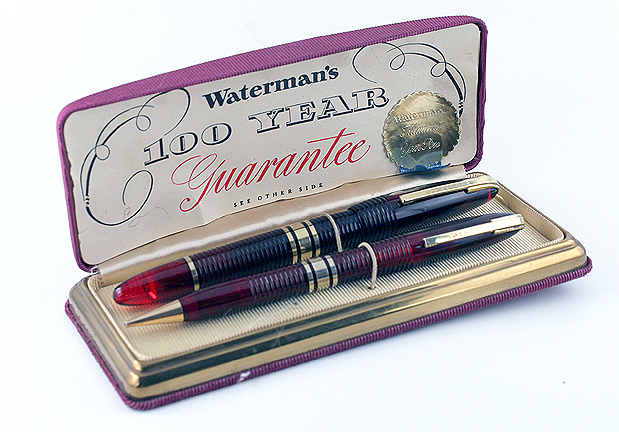 1939 Waterman 100 Year LF Set in Translucent Red. The first year model, with the over-the-top “Soldier” clip, designed to set far down into the uniform shirt pocket. This clip was only used the first year of production, and is quite rare. GFT. Medium/broad, flexible nib. New-old-stock. Mint in original box with original 100 Year guarantee. Close-up of set in box. 1939 Waterman Twist-activated pencil for above set. 1941 Waterman #2 LF Military Set in Bronze Pearl (rare). GFT. Over-the-top “soldier” clip, designed so the pen and pencil set very low in the uniform shirt pocket. Medium/fine nib. Near mint in original leather pouch. The pouch is quite worn, but in good light the original military “eagle” emblem can still be made out on the pouch. Close-up of set in pouch. 1945 Waterman “Junior Iic” #2 size PISTON-FILL in Burgundy. Yes, there is a vintage Waterman piston-fill pen! CPT. Visualated barrel with rectangular windows (hidden under cap when closed). Nib signed “JIF 585 Junior.” Broad, left-oblique nib (shaped like the right foot). New-old-stock. Mint. 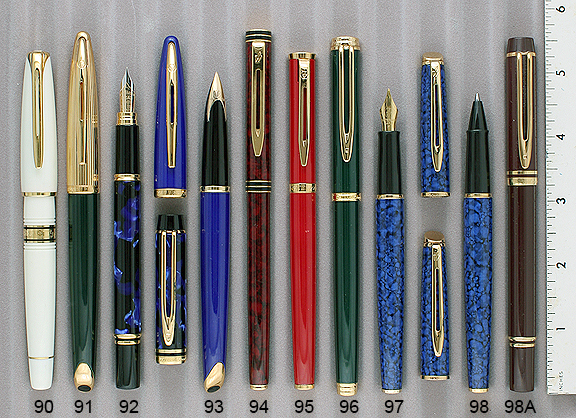 See below for another Waterman vintage piston-fill pen. 1945b Waterman “Junior” #2 size PISTON-FILL in Burgundy. CPT. Visualated barrel (hidden under cap when closed). Nib signed “JIF 585 Junior.” Medium, flexible nib. Near mint. 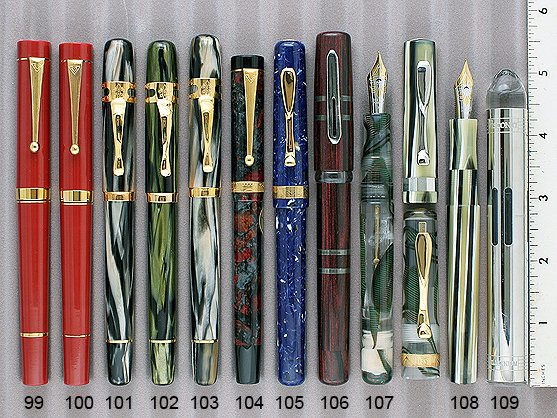 See above for another Waterman vintage piston-fill pen. 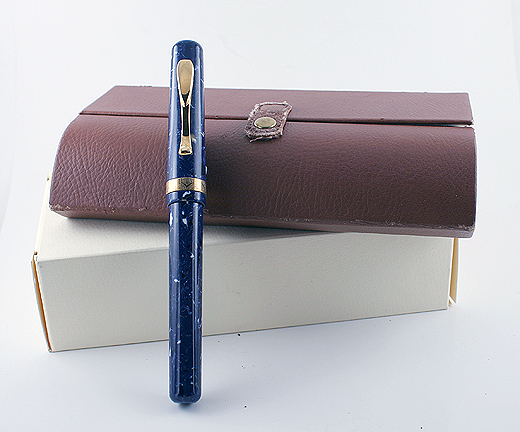 1946 Waterman #2 LF in Blue Pearl with 18K gold-filled overlay made by Kosca for Waterman Italy. Wonderful barley design, with formed smooth “bars” at the top of the cap and bottom of the barrel in an Empire” pattern. 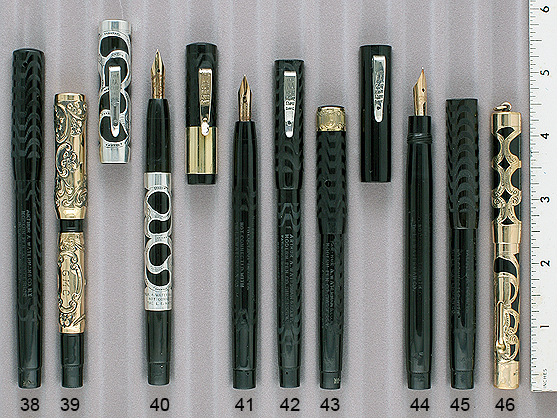 At that time Kosca was the official manufacturer of overlays for both Waterman and Parker in Italy. USA made pen. Cap lip signed “Waterman’s Ideal 18KR.” Fine, triple-flexible nib. Near mint. 1970 Waterman Prototype C\F Ball Pen in Etched Sterling Silver. Twist Activated. 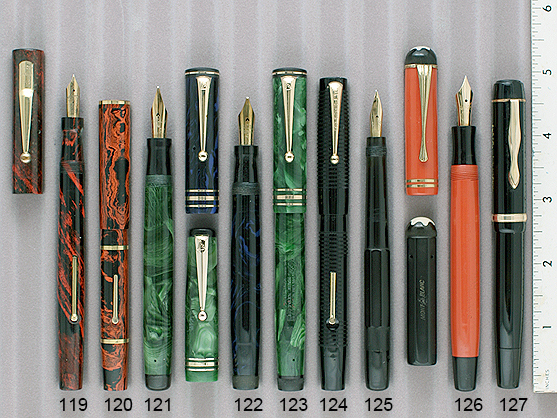 From the Waterman President’s collection. Near mint. 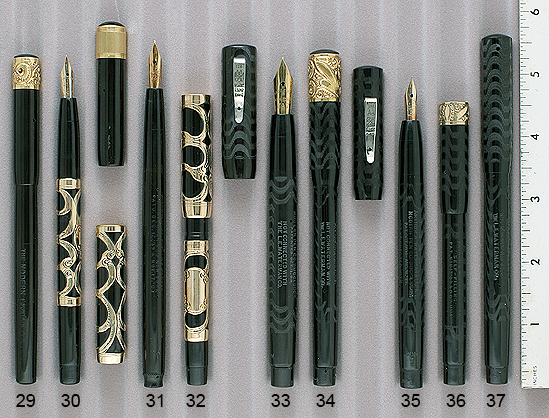 1915 Waterman 52 LF in Black Chased Hard Rubber. NPT. Extra-fine nib. New-old-stock. Mint. 1915 Waterman 52 LF in Black Chased Hard Rubber. NPT. Medium/fine, flexible nib. New-old-stock. Mint. All restored and working. All use modern Senator refills (and probably other refills as well). 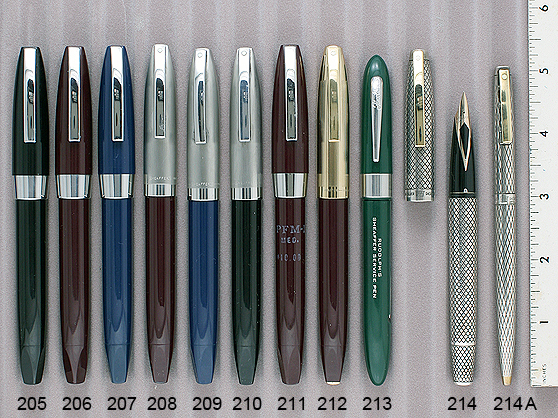 Before Paper Mate, most all ball pens were unreliable to use and often created a mess of thick ink. At the end of the 1940s no one was buying them anymore. Patrick Frawley worked to find an ink which solved these problems and is said to have saved the entire ball pen industry. With this ink, in the early 1950 he founded the Paper Mate Company. He set up an extensive sales network and then advertised heavily, using celebrity endorsers and TV show sponsorship’s. The brand thrived! 1955 Paper Mate Button-activated two-tone pen in Cream & Grey. Chrome trim. It came in many color combinations and advertising suggested you buy the same colors as your car. Near mint. 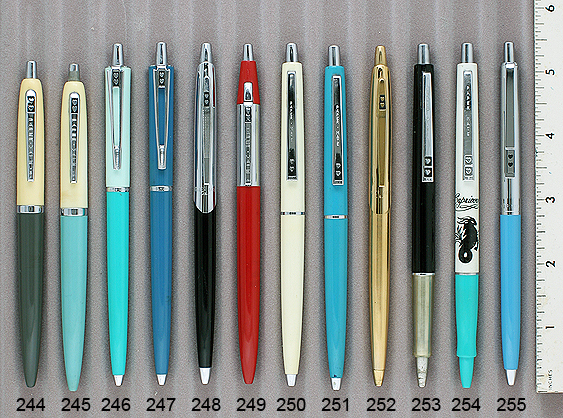 1955 Paper Mate Button-activated two-tone pen in Cream & Blue. Chrome trim. It came in many color combinations and advertising suggested you buy the same colors as your car. Near mint. 1959 Paper Mate “Holiday” button-activated two-tone in Light and Dark Turquoise. Chrome trim. Near mint. 1959 Paper Mate “Holiday” button-activated in Blue. Chrome trim. Near mint. Close-up of pen in box. 1959 Paper Mate “Capri Mark III” button-activated in Black with Chrome cap. Near mint. 1959 Paper Mate “Ninety-Eight” button-activated in Red and Chrome. The retractor button is mounted above the clip. Near mint. 1959 Paper Mate Button-activated in Cream. Chrome trim. Near mint. 1959 Paper Mate Button-activated in Blue. Chrome trim. Near mint. 1959 Paper Mate “Capri Mark IV” button-activated in Gold-filled. New-old-stock, mint in original packaging. 1966 Paper Mate Button-activated in Black with rocket-shaped gripping section. Chrome trim. Near mint. 1966 Paper Mate Button-activated in two-toned Cream and Turquoise with rocket-shaped gripping section. Chrome trim. Imprinted on the pen is “Capricorn” with a crab. On the back side of the pen are the Capricorn dates (12/22 – ½0) and a list of positive personality traits of those who are Capricorns. Near mint.